HBO has released the first trailer for its new documentary Beware the Slenderman, which will premiere on the cable network January 23, 2017. Fans attending the Doc NYC festival will get to see this film early on Saturday, November 12. This harrowing documentary goes inside the case of two Wisconsin teenagers, who tried to murder their friend, in honor of The Slenderman, a character created by Eric Knudsen that first surfaced on the Internet forum Something Awful back in 2009. Lurking in the shadows of the Internet, a faceless modern-day bogeyman has attracted the attention and fear of a young generation who whisper his name online. 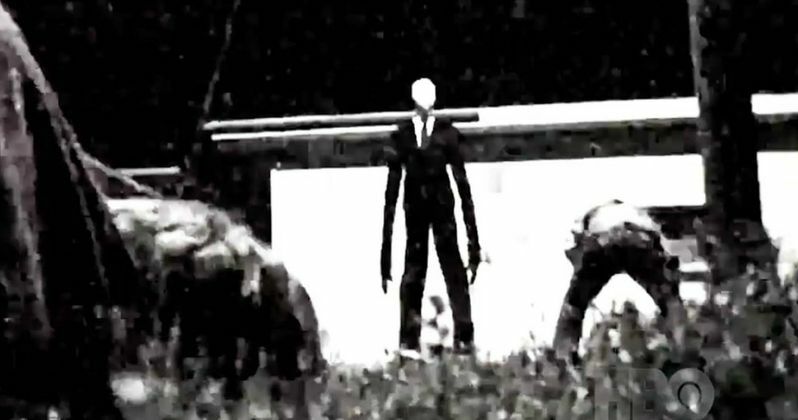 Slenderman lives on the dark pages of the web, where impressionable youth create and cultivate his mythos in message boards, YouTube clips and various other digital incantations. But the online fairy tale becomes a shocking real-life horror as two 12-year-old girls, guided by their devotion to Slenderman, lure their friend into the woods to attempt a seemingly inexplicable, brutal murder. From the depths of one the Internet's most unsettling creations to the court case that must consider the consequences, Beware the Slenderman brings to light questions of accountability in an age where young, growing minds are only a few clicks away from creating and consuming something that may influence them to commit unspeakable crimes. Here's what director Irene Taylor Brodsky had to say in a statement from Buzzfeed. "The narrative does not revolve around guilt or innocence, but instead the court's deliberation whether the girls should be tried as adults or children. Above all, it is the anguish and astonishing honesty of the girls' parents that anchors the film's narrative to its tragic core." The film centers on 12-year-old girls Morgan Geyser and Anissa Weier, who were accused of stabbing their friend Payton Leutner, 19, several times, so that they could become "proxies" to the myth known as the Slender Man. Payton Leutner survived, and her attackers told police that they had planned the attack for months, leaving Payton in the woods so they could find the Slenderman's mansion. The were found by police four hours after the stabbing, six miles from the crime scene. The film uses home videos, interviews with family members and footage from the girls' confessions. Both girls are seeking separate trials and being held at a juvenile detention facility, before they return to court tomorrow, November 11. Take a look at this new trailer for Beware the Slenderman, along with the new poster.